Facebook's stock opened at $42 but has plunged quickly. 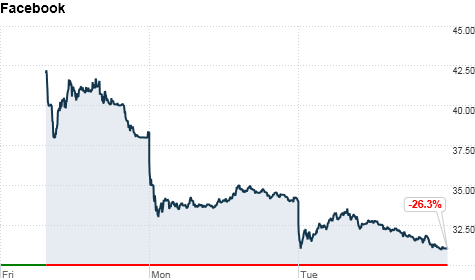 NEW YORK (CNNMoney) -- Facebook continued to plunge as its stock dropped nearly 9% Tuesday. Facebook (FB) fell as low as $30.98 per share just minutes after the opening bell. That's 18% below $38, the price of its initial public offering, which debuted on the Nasdaq on Friday. The stock ended the day down 8.9% at $31. "It's very promising, of course, but it's not a proven model," said Brian Wieser, an analyst for Pivotal Research Group who rates Facebook a "sell" with a price target of $30 per share. Going forward, Wieser said that Facebook will have to "evolve" its advertising platform to appeal to large-scale advertisers. He said this will increase operating expenses, especially since the company might have to make large acquisitions to compete against Google (GOOG, Fortune 500). But there is also a sense that Facebook could become more valuable, says Daniel Ernst, an analyst for Hudson Square Research. He said Facebook offers "an unprecedented level of targeting" for advertisers with its more than 900 million users, so there's a "long-term future" for the social media company. "They have a great core product, [but] they need to improve the advertising model around that," he said. "There are reasons to sit on the sidelines. That's why we have it on hold." The IPO price for the social media giant was set by 33 underwriters, led by Morgan Stanley (MS, Fortune 500). JPMorgan Chase (JPM, Fortune 500) and Goldman Sachs (GS, Fortune 500) were also prominent in the process. Trading for the social media giant was volatile on Friday, but the volume set a new record for IPOs. However, the stock closed just 23 cents above its IPO price -- even though Facebook was considered one of the most highly anticipated IPOs in recent memory. The share price dropped 12% on Monday, falling well below its IPO price. Facebook's competitor Zynga (ZNGA), which had plunged in sessions following Friday's IPO, slipped 4% Tuesday. Facebook Chief Executive Officer and co-founder Mark Zuckerberg has been particularly busy in the last few days. He married his long-time girlfriend Priscilla Chan during the weekend following Facebook's stock debut.